The ELECTRIC 15 came about from a conversation with the president of the Electric Boat Association (Ken Mathews) at an annual electric boat gathering in St Michaels, MD. 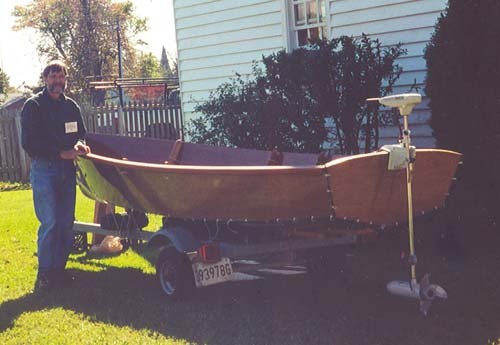 He thought there would be interest in an entry level electric boat that would be economical and fun to build by families and groups. A trolling motor would be used for propulsion because of it's ease of installation and availability. The ELECTRIC 15 is built using the stitch and glue method, so no specialized tools or skill are required. She is stable and has a 500lb capacity. Three type 27 deep cycle batteries will provide enough electricity to cruise at 5 knots with full load for about 8 hours. Lighter loads will be faster and travel farther. She will be ideal for exploring the waterways or sunset cruises in style. Look for larger versions in the future. Estimated cost for quality construction materials (not including power or sails) is $850. This cost includes a high level of outfit and finish you can be proud of after putting the effort into building this fine boat. Purchase Study Plans for the ELECTRIC 15 for $5.00 for delivery by US Postal Service [no download file available]. Purchase Construction Plans for the ELECTRIC 15 for $70.00 for delivery by US Postal Service. Purchase Full Size Frame Lofting for the ELECTRIC 15 for $70.00 for delivery by US Postal Service.